Welcome to our guide to the Dalmatian Terrier mix. Both Dalmatians and terriers are known for their bold and happy dispositions. Does that make this mixed breed the perfect choice for you? In this article we examine Dalmatian Terrier mix looks, personality, and health, so that you can answer with confidence. But before we dig in, let’s note that the Dalmatian Terrier mix is a “designer dog”. There is a lot of debate surrounding mixed breeds versus pedigree or purebred dogs—the subject often divides opinion. Many traditionalists believe that it’s important purebred dogs are kept on a closed list and only bred amongst themselves. This means that a litter of purebred puppies have a reliable looks and personalities, and their health is likewise foreseeable. It’s true that a first generation cross between two pedigrees is less predictable. Their appearance and temperament become luck of the draw. They could take strongly after one parent, or resemble a real mishmash of both. But what of their health? For many pedigree dogs, generations of breeding within a restricted gene pool has lead to a high frequency of hereditary illnesses. These illnesses have accidentally become fixed in breeding lines alongside the desirable traits breeders wanted to harness. Inbreeding, even within a population of dogs which seems quite large can also diminish sperm count, litter size, and newborn survival. Crossbreeding expands a dog’s gene pool again, which can protect them from some hereditary diseases, and improve their biological fitness. So designer dogs have pros and cons – whether they tip in your favor or not is a personal matter. But now we’ve covered this important detail, let’s find out more about the Dalmatian Terrier mix. Where does the Dalmatian Terrier Mix Come From? The Dalmatian Terrier cross is relatively uncommon, so there’s not much information out there about the exact history of this mix. We do know a lot about the parent breeds though. So let’s take a quick look at the history of both the Dalmatian and the Terrier. The eye-catching spots of the Dalmatian certainly make it a distinctive and instantly recognizable breed. While the exact origin of the breed is a little hazy, they are thought to have originated from a region of Europe once known as Dalmatia. Dalmatians were originally coach-dogs, trotting along beside horse-drawn coaches and guarding the coach when it was left unattended. Dalmatians also have strong links to the Romani people, as well as with British nobility. Today, they are the ‘mascot’ of many fire stations. They are also famous for accompanying the Budweiser Clydesdales on their parades. There are many different types and breeds within the Terrier group, but almost all of them originate from the United Kingdom and Ireland. Historically, terriers were farm dogs bred to control vermin. Genetic studies show that the majority of terrier breeds were developed from the same ancestors. While terrier breeds share common roots, their temperaments can vary from breed to breed. Therefore, we recommend researching the particular breed of parent terrier of any Dalmatian Terrier mix puppy you’re interested in. It’s hard to predict exactly what your Dalmatian Terrier mix will look like, as this will very much depend on the breed of terrier. It can help to become familiar with the appearances of the parent breeds, so let’s take a quick look at those now. Dalmatians are a medium-sized dog, standing 19 to 24 inches tall and weighing 45 to 70 lbs. They belong to the non-sporting group, but their heritage as coach dogs mean they have an athletic, muscular build. Their coat is short, but of course, it’s most distinctive feature are those spots, which can be black or liver in color. Dogs within the terrier group range from tiny toy terriers to larger working breeds. The diminutive Yorkshire terrier weighs only 7 lbs and has a long, silky coat. While the Airedale terrier can reach 70 lb (similar to a Labrador Retriever!) and his short coat is dense and wiry. The Dalmatian Terrier mix will often be a little shorter and bulkier than a purebred Dalmatian. But the size difference might be smaller than you expect if their terrier parent was a larger breed. If their terrier parent has a wiry coat (as many do) then your Dalmatian Terrier mix’s coat might be rougher than a Dalmatian’s too. Many Dalmatian Terrier mixes feature the distinctive spotted coat of the Dalmatian, but there’s no guarantee this will be the case. Dalmatians are known for their alert and energetic natures, which is combined with a sensitive streak. Their history as an athletic guard dog is still obvious in the breed and the instinct to guard their families is still relatively strong. Terriers are, as a rule, happy and fearless. They are also brave and tough, which means they will try to play with dogs much larger than themselves. Historically, terriers were bred to bark, so may well bark more than other breeds. Terriers also have a strong hunting instinct, which means they sometimes enjoy chasing cats, squirrels, and other small, fast-moving animals! If you keep rabbits or guinea pigs, take care that they are kept in a separate and secure area. Dalmatians are energetic dogs and benefit from regular exercise. If they don’t receive enough mental and physical stimulation, they can easily get up to mischief. As intelligent yet sensitive dogs, Dalmatians benefit most from positive, rewards based training. Terriers are generally athletic and eager to please, but they can be stubborn. Broadly speaking, smaller terriers which have been raised as lapdogs for longer are more likely to be tricky to train. Some, such as the Yorkshire Terrier, are better suited to experienced dog owners for this reason. Attending puppy training classes is a great way to socialize your mixed breed puppy. Following an online training guide is also a wonderful way to bond with your dog. Don’t overdo it with your mixed breed puppy though. While both these breeds are energetic, bear in mind that a puppy’s bones and joints won’t be fully developed until they’re at least two years old. It’s important to be aware of any health issues of both parent breeds, so you’re familiar with how these may impact your mixed breed puppy. Deafness is an issue that affects as many as 1 in 8 Dalmatians, and a reputable breeder will be able to show you hearing tests for the Dalmatian parent dogs, as well as their puppies. These tests are commonly referred to as brainstem auditory evoked response (BAER) tests. Dalmatians are also prone to bladder and kidney stones, due to a gene mutation which causes high levels of uric acid. The gene responsible for this trait was identified in 2008. The UC Davis’ School of Medicine offers DNA testing for this mutation, with the hope of eliminating the trait altogether. The Dalmatian Club of America recommends that breeding dogs are BAER tested, as well as being tested for hip dysplasia. Other elective tests include eye exams and thyroid evaluations. Breeders should be happy to talk through the results of these tests with you. Dalmatians are usually expected to live to around 11 to 13 years. Their short coats do shed quite a bit, but only require weekly brushing and the occasional bath to stay in good condition. Terriers are, on the whole, a healthy group. It’s important to research the potential health issues of any particular breed of Terrier which has been used to produce the Dalmatian Terrier mix puppies that you’re interested in. For example, Border Terriers can be sensitive to hot weather and allergies, while the large Airedale Terrier can suffer from hip dysplasia. A reputable breeder or rescue center will be able to talk you through any health concerns. West Highland White Terriers are also known to have a high prevalence of congenital deafness. 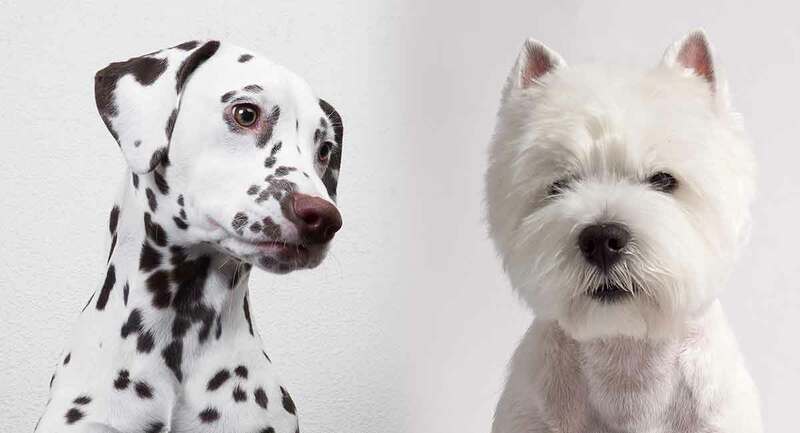 Since they have this in common with Dalmatians, it is even more important to ask for BAER tests on any mixed breed puppies with a Westie parent. Terriers can live for up to 16 years. So a healthy Dalmatian Terrier mix should live between 11 and 16 years too. Do Dalmatian Terrier Mixes Make Good Family Dogs? Both Dalmatians and terriers can make great family pets. There’s no reason why a mixed breed puppy can’t do the same. But these breeds do have some characteristics you need to be aware of. The sensitivity of the Dalmatian can be combined with the tenacity and stubbornness of the terrier. You’re more likely to have a positive experience with a Dalmatian Terrier if you have lots of time and resources for training. This mix needs plenty of exercise and mental stimulation – doggy jobs which work their mind as well as their body. With that said, the energetic nature of Dalmatians and the enthusiasm of terriers can be combined to make a wonderful family pet. As with any breed, care should be taken to introduce your puppy to children carefully. Always ensure your dog has a safe space to retreat to when they want some peace and quiet. If you decide to buy a puppy from a breeder, it’s important to do your research. Avoid pet stores and puppy mills as the welfare of puppies and parent dogs are often not a huge concern. Instead, focus your search on reputable breeders, who are happy to talk you through health tests and let you meet both parent dogs. Mixed breeds are becoming more and more popular due to their general reputation for good health. In addition, mixed dogs can combine the best traits of two different breeds. Use our puppy search guide to help you find the perfect puppy for you and your family. Raising a puppy, whichever breed or mix you choose, takes time and dedication. Depending on your puppy, you may find they pick up certain aspects of their training quickly. And you may need a little more help with others. If you haven’t owned a puppy before, training your new pup can be a little daunting. Even if you have had puppies before, it may have been a few years ago. We all know puppies have different personalities and respond differently to training techniques. We recommend reading our guides to puppy training, including choosing the right method for your puppy, potty training, crate training, and more. Our puppy care guide also includes plenty of useful information such as how to select the best puppy food, grooming, and socializing methods. If you’re still weighing up whether or not this mix is right for you, here are some potential disadvantages, as well as advantages. Some cons are that the high prey drive of terriers can cause trouble with other household or neighborhood pets. They will chase cats, so the ability to recall them is essential. Terriers are known for barking, so if you live in an apartment, this is something to bear in mind. Dalmatians can be overly sensitive, which can cause them to become neurotic if they feel insecure. Both Dalmatians and terriers are enthusiastic dogs with a lust for life. Having an enthusiastic dog such as this at your side can be a great mood booster. Their intelligence means training and agility classes will be fun and rewarding for you both. Bear in mind that we’re all as individual as our puppies, so a disadvantage to you may be a big advantage to someone else! and the ever-popular Border Terrier. Rescuing a dog can be a wonderful way of finding a loyal family pet. If you’d like to rescue a Dalmatian terrier mix, it’s a good idea to register with local animal shelters that will inform you if they take in a dog who fits the bill. While there aren’t any rescue centers dedicated to this particular mixed breed (that we’ve found), there are a number of centers for the parent breeds. The British Dalmatian Welfare site has a list of dogs looking for new homes in the UK, as does the Willing Hearts Dalmatian Rescue based in the US. There are numerous organizations which rescue and rehome terriers, including Cairn Rescue USA and Terrier Rescue in the UK. If you know of any other rescue organizations, including in Australia and Canada, please let us know in the comments below. Is a Dalmatian Terrier Mix Right For Me? If you’re looking for a bold and enthusiastic new member for your family, a Dalmatian terrier mix might be just what you need. The combination of energy, alertness, and sensitivity can make this mix a wonderful one. As with any mixed breed, you’ll never be quite sure how your puppy will turn out. But with the right mix of love and training will give them the best possible chance to blossom into your perfect dog. Bannasch et al. 2008. Mutations in the SLC2A9 gene cause hyperuricosuria and hyperuricemia in the dog. PLOS Genetics. Ostrander. 2007. Genetics and the shape of dogs: studying the new sequence of the canine genome shows how tiny genetic changes can create enormous variation within a single species. American Scientist. Selvaraj et al. 2018. Deafness evaluation and brainstem auditory evoked response (BAER) testing in dogs. Journal of Entomology and Zoology Studies.